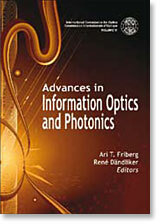 Volume VI - Advances in Information Optics and Photonics is the ICO's latest publication. The contents highlight the advances and trends in the research and development of optical sciences, technologies, and applications at the time of their publication. This time, and in order to cover a larger margin of ICO activities the Volume VI is published as a six years period (2003-2008). In this age of the photon, information optics and photonics represent the key technologies to sustain our knowledge-based society. New concepts in classical and quantum-entangled light and coherent matter and novel materials and processes have lead to remarkable advances in today's information science and technology. The ICO is closely involved with information optics, as exemplified by the ICO topical meeting on Optoinformatics / Information Photonics (St. Petersburg, Russia, 2006), the ICO/ICTP Winter College on Quantum and Classical Aspects of Information Optics (Trieste, Italy, 2006), and the many ICO Prizes recently awarded on outstanding contributions on these topics. This book is in part based on these ICO activities. This volume VI contains a collection of thirty two chapters from internationally leading scientists and research groups on a variety of topics in information optics and photonics, including the 2003-2006 ICO Prize winners. The chapters are divided into seven sections: Beam Optics; Laser Photonics and Components; Electromagnetic Coherence; Imaging, Microscopy, Holography and Materials; Photonics Processing; Quantum Information and Matter; and Communications and Networks. The present volume was edited by Ari T. Friberg, ICO President, and René Dändliker, ICO Past President (2005-2008) and it is published by SPIE Editions and issued last June 18, 2008. It is worth to extract here part of the Preface written by both the Editors: "Besides highlighting the main developments of international optics and photonics, the aim of this book series is to promote the general awareness of the ICO and raise funds for its global activities, in particular the traveling lecturer program, which is aimed at enhancing optics in developing nations. Therefore all royalties will go to the ICO for that purpose. In today's 'age of light', optical information science and technology play a central role. The ICO has a long tradition in the subjects of information optics, dating back to the ICO topical meetings in Kyoto, Japan 1994 (Frontiers in Information Optics) and Tianjin, China 1998 (Optics for Information Infrastructure). The ICO has also been a permanent sponsor of the Optical Computing / Optics in Computing conferences, a series of meetings spanning well over a decade. In 2006, the ICO organized two key events on information optics: the ICO topical meeting on Optoinformatics / Information Photonics in St. Petersburg, Russia (Chairs A. V. Pavlov, M. L. Calvo, and J. Jahns) and the ICO/ICTP Winter College on Optics in Trieste, Italy, with title "Quantum and Classical Aspects of Information Optics" (Directors P. Tombesi, M. L. Calvo, and P. Knight). Additionally, the recent ICO Prizes - most notably those in 2003 (B. J. Eggleton), 2004 (A. V. Krishnamoorthy), 2005 (I. Bloch), and 2006 (H. Sotobayashi) - have dealt with various basic and applied aspects of optical information. Hence it was quite natural to take advantage of these developments and focus the current volume of the ICO Book series on Advances in Information Optics and Photonics. The present volume VI differs from the previous ones in at least three respects: it concentrates on a specific, though extremely important, topic within the broad field of optics and photonics, it does not contain the words 'International Trends' explicitly in the title, and it is published as a paperback. We hope that with these changes the book will find its way as a standard reading and reference material on the topic. The volume consists of thirty two invited contributions from scientists or research groups working throughout the world on optical information science, technology, and applications. Many of the authors have actively participated in the ICO conferences and other activities and all of them are internationally recognized leaders in their respective subjects. Many new concepts in classical and quantum-entangled light, coherent interaction with matter, novel materials and processes have lead to remarkable breakthroughs in information science and technology". It is expected that presentation of this new volume will take place at the occasion of the forthcoming ICO General Congress, ICO-21 and General Assembly to be held next July 7 to 10, 2008 in Sydney, Australia. Some copies of the book will be as well available for inspection at the ICO booth of the congress along with order forms. 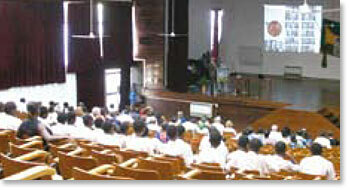 The ICO's 2007 Topical Meeting was held at the University of Cape Coast in Ghana, Africa. 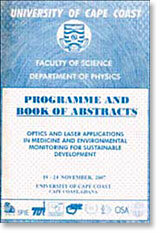 A book of abstracts from the 2007 ICO Topical Meeting, edited by the University of Cape Coast, Ghana. Every year that the General Congress occurs, the ICO organizes Topical Meetings - major events dedicated to specific relevant subjects with a focus on industrial applications. 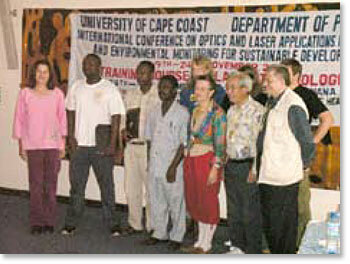 For 2007 the Topical Meeting was held at the University of Cape Coast (UCC), Ghana, from 19 to 24 November. This is only the second time that an ICO Topical Meeting has been held in Africa (in 2000 one was held in Dakar, Senegal). The International Conference on Optics and Laser Applications in Medicine and Environmental Monitoring for Sustainable Development was hosted by the Laser and Fiber Optics Centre at UCC, and proceedings from the meeting have been used to compile a book of abstracts, edited by the university. The African Laser Atomic and Molecular (LAM) Network, in collaboration with UCC and the government of Ghana, organized the Topical Meeting to expose African participants to current developments in lasers for medicine and environmental monitoring. The ICO and the International Society on Optics within Life Sciences (OWLS) were using the same gathering as the ICO Topical Meeting. The Optical Society of America (OSA) sponsored the training programme, while the International Society for Optical Engineering (SPIE) provided prizes for the best oral presentations and posters. Pictured here are the meeting's prize winners and their panel of judges. The prizes were awarded as follows. Best student poster presentation: Gwamuri Jephias (second from the left) from the Department of Applied Physics, Bulawayo, Zimbabwe for his poster on "Investigating Light Propagation in Turbid Media by Evaluating Optical Properties of Phantom Tissues". The best student oral presentations went to: Kassahun Ture (third from the left) from the Department of Physics at Addis Ababa University, Ethiopia for his paper on "Optical Properties of Coffee and Caffeine"; Märta Cassel-Engquist (second from the right, back row) from the Department of Physics at Lund University, Sweden, for her paper on "Diode Laser Based Techniques for Measuring Gas in Human Sinuses"; and Mikkel Brydegaard (third from the right, back row), also from the Department of Physics at Lund University, for his paper on "Contrast Functions and Spectral Data Handling". The panel were (from the right): Yehia Badr, Ichirou Yamaguchi, Katarina Svanberg and Maria Calvo. Meeting chair Paul Buah-Bassuah is in the centre. West Africa: Nigeria 5; Ghana 10; Côte d'Ivoire 4; Senegal 3. Prof. Sune Svanberg, from Lund Institute of Technology - a member of the Royal Swedish Academy of Sciences and the Nobel prize committee - delivering a plenary lecture entitled "The Nobel Prize in Physics: Science, Selection and Celebration". Meeting chair and local organizer Prof. Paul Buah-Bassuah and LAM president A Wagué, expressed, on behalf of the advisory board, national organizing committee and local organizing committee, their thanks to the international organizations that sponsored the conference - ICO, ICTP, IUPAP, OSA, OWLS and SPIE. Other institutions and entities - such as Tema Oil Refinery, The Association of Oil Marketing Companies, and the Laser and Fibre Optics Centre at UCC - also provided financial and strategic support. Prof. Buah-Bassuah also thanked the conference participants for contributing to its success. The 2006 ICO Galileo Galilei Award ceremony also took place at the meeting. Prof. Mohammed Shabat from the Islamic University of Ghaza received the prize and delivered his lecture on "Education and Research in Palestine: Challenges and outlook". A special session dedicated to the memory of the late Arthur H Guenther, former ICO president, and the late Gallieno Denardo (who was responsible for the optics programme at the Abdus Salam International Centre for Theoretical Physics in Italy) was a very moving event during which colleagues and friends remembered the outstanding contributions that they had both made to the optics community. A round-table event was chaired by P Chavel on the last day of the meeting. Fruitful discussions took place about arranging future activities to ensure the continued support for research into optics and photonics, as well as education programmes in African countries. The ICO bureau also met in Accra, Ghana, on 17 and 18 November for its 2007 annual bureau meeting. AIP publishes the proceedings of the 2007 RIAO/OPTILAS conference. Cover of the AIP Conference Proceedings, volume 992, which records the proceedings of the RIAO/OPTILAS 2007 conference. The Proceedings of the last RIAO/OPTILAS 2007 conference, that was held in Campinas, São Paulo, Brazil, 21-26 October 2007 (see this Newsletter, issue 75, April 2008) have been published inside the American Institute of Physics (AIP) Conference Proceedings Series, as Volume 992. The Editors of the publication are Niklaus Ursus Wetter, from the Institute for Nuclear and Energetic Research, Center for Lasers and Applications, São Paulo, SP-Brazil and Jaime Frejlich from IFGW-UNICAMP, Laboratório de Optica, Campinas-SP, Brazil. The Proceedings belong to the subseries on Atomic, Molecular and Optical Physics. Its have been published by May 2008 as a one volume, hard cover and a total of 1,364 pages. As for the interest of the readers one can mention the resume of the Editors in which they indicate that all researchers all over the world interested in research and education in Optics, mainly members of the Latin-American and Iberian countries may be interested in the contents. As well one can consider researchers, scholars, governmental development agencies of countries all over the world who are interested in knowing the state of Optics in this region of the world and members of the international scientific community looking for partners for cooperation projects on specific topics on Optics and possibilities of researchers and graduated students exchange. Also, contents of the Proceedings are of interest for organizations looking for possibilities of supporting specific activities in Optics in the area or in specific countries in the Latin-American sub-continent. All papers have been peer-reviewed. The conference focused on research activities on all areas of Optics, mainly in Latin-American and Iberian countries, but also in other countries all over the world as well. A specific session for Education in Optics was also included. The main interest of the conference was offering a general view of the present research activities and trends on Optics in the Latin-America area because all countries in the region with a significant activity in Optics were well represented, including senior and young researchers as well as graduated students talking about their PhD and MSc thesis work. Topics discussed included: atmospheric optics; color, vision and radiometry; diffractive optics; education for optics; guided optics; holography and interferometry; lasers and quantum optics; metamaterials; nonlinear optics; optical instruments; optical materials and applications; optical metrology; optical processing; optical spectroscopy; thin films. ICO welcome this type of publications that are a clear sign of activity and dynamism in the field of optics and photonics in the Latin-American area of the world. To this concern ICO congratulates the Editors and scientists participating in this event while encouraging similar activities in a near future and in which ICO will be always interesting in providing the necessary support. A report from ICOLA 2007 in Indonesia confirms the dynamism of optics and photonics activities in east Asia. The 2nd International Conference on Optics and Laser Applications, ICOLA 2007, was organized by the Study Program on Opto-Electrotechniques and Laser Application, Department of Electrical Engineering, at the University of Indonesia, last September 5-7, 2007, at the Inna Garuda Hotel, Yogyakarta, Indonesia in conjunction with the 30th Anniversary of the study program. The ICOLA 2007 was technically supported by the International Commission for Optics (ICO), the International Society for Optical Engineering (SPIE), and the Abdus Salam International Center for Theoretical Physics (ICTP), in cooperation with other local professional societies such as: HFI, HAI, IEEE Indonesia Section, etc. The participants came from USA, Japan, South Korea, P.R. China, Taiwan, Thailand, Singapore, Malaysia, Bangladesh, India, Iran, Yemen, Algiers, Moldova, Ukraine and the Netherlands. Around seventy five extended abstracts (invited, overseas and domestic), and about fifty five selected or reviewed papers presented in the conference. Those papers were divided into three categories: A: Nanotechnology, Biomedical Optics and Optical Communication. B: General Optics, Holography and Laser Technology. C: Photonics Devices/Materials, Design and Applications. The conference was formally opened by Prof. Rinaldy Dalimi, Dean of the Faculty of Engineering, University of Indonesia, and the Keynote Speaker was Prof. Bambang Hidayat, Chairman of the Indonesian Academy of Sciences, entitled: "Scientists and their society, between advocacy and arbitration", which can be freely downloaded from: http://icola2007.net in the Speakers menu. The conference was also declared a YOGIA ACCORD, consists of five items, signed by the invited speakers and other participants, at the farewell dinner near Parambanan Temple, before Ramayana Ballet Performance, where one item stated that the ICOLA 2009 will be held in Singapore, and the event will be alternatively continued regionally outside and inside Indonesia. The Optical Society of India elects a new executive council. President - Dr T K Alex, director of Laser & Electro Optics Systems at the Indian Space Research Organisation, Bangalore. Vice-president - Prof. Anurag Sharma, Department of Physics at the Indian Institute of Technology, Delhi. General secretary - Prof. L N Hazra, Department of Applied Optics & Photonics, Calcutta University. Treasurer - Dr K Bhattacharya, Department of Applied Optics & Photonics, Calcutta University. Members - Dr A K Gupta, Photonics Division, Instruments Research & Development Establishment, Raipur Road, Dehradun; Prof. B P Pal, Department of Physics, Indian Institute of Technology, Delhi; Dr N Krishna Mohan, Department of Physics, Indian Institute of Technology, Madras Chennai; Dr S V Ramgopal, Central Scientific Instruments Organisation, Chandigarh; Prof. R M Vasu, Instrumentation Department, Indian Institute of Science, Bangalore; Prof. C S Narayanamurthy, Department of Space (Government of India), A T F Campus, V S S C, ISRO (P O), Thiruvananthapuram; Dr S K Bhadra, Optical Communications, Fibre Division, Central Glass & Ceramic Research Institute, Kolkata; Prof. D Narayana Rao, School of Physics, University of Hyderabad, Hyderabad; Dr K R Suresh Nair, Director, NEST R & D Centre, Cochin Special Economic Zone, Kakkanad, Cochin; Dr P P Sahu, Department of ECE, Tezpur University, Napam, Tezpur; Dr P T Ajithkumar, Light Logics Holography & Optics Pvt. Ltd., Crescent Hill, Thiruvallam. For further information about the elections see the Optical Society of India's website at http://www.osiindia.org.